And you get her side of the story in I, Tonya. One of the most difficult moves in professional figure skating competitions is a triple axel, which requires the skater to leap forward from the outside edge of one skate blade, rotate three and a half times in the air, and land on the back outside edge of the opposite foot. Only eight women have landed the jump in competition, and Tonya Harding is one of them. In director Craig Gillespie's new biopic I, Tonya, Harding (Margot Robbie) reminisces about having been the first American woman to accomplish this feat in 1991. "Sorry," she says, wiping away tears. "Nobody asks me about that anymore." Instead, Harding's name is synonymous with one of the biggest scandals in sports history: a "hit" on rival figure skater Nancy Kerrigan after a practice session at the 1994 U.S. Figure Skating Championships, a lead-up event to the Winter Olympics; the perpetrator was hired by Harding's ex-husband, Jeff Gillooly (Sebastian Stan), and her bodyguard, Shawn Eckhardt (Paul Walter Hauser). "The incident," as the characters in I, Tonya ominously refer to it, occurs about halfway through the film, but writer Steven Rogers positions Harding's version of the story as the central narrative and tells it in mostly chronological order, beginning in her childhood. Rogers and Gillespie imply that Harding was also a victim, unfairly maligned by the media and its consumers. They argue that what Harding insists to this day—that she didn't know about the attack until after it happened, and that she delayed going to the authorities out of fear of Gillooly and unjust punishment—is the truth. The time line of the scandal, though largely told from Harding's perspective, corresponds with the actual events. A man later identified as Shane Stant whacked Kerrigan just above the knee with a police baton as she was leaving practice, then made his escape in a getaway car. The injury forced Kerrigan to withdraw from nationals, which Harding won, but both women were selected for the U.S. Olympic team, and they competed in Lillehammer, Norway, seven weeks after the attack. In the interim, the media pounced on Harding. Eckhardt confessed to the FBI not long after the attack. A few days later, Harding met with FBI agents and separated from Gillooly, with whom she'd still been living despite their 1993 divorce. Gillooly subsequently turned himself in, and Harding read a statement to the press in which she denied involvement in Kerrigan's assault but admitted she'd learned about it and had waited to report it. At the Olympics, Kerrigan won the silver medal and Harding placed eighth. A few weeks later, Harding pleaded guilty to conspiring to hinder prosecution of the attackers. Consequently, the U.S. Figure Skating Association stripped her of her titles and banned her from professional figure skating for life. Gillooly, along with bodyguard Eckhardt, assailant Stant, and getaway driver Derrick Smith all received prison sentences ranging from 18 months to two years long. Gillespie and Rogers include faux-documentary interviews that draw from the 2014 ESPN documentary The Price of Gold and more recent discussions Rogers conducted with the real Harding, Gillooly, and others. 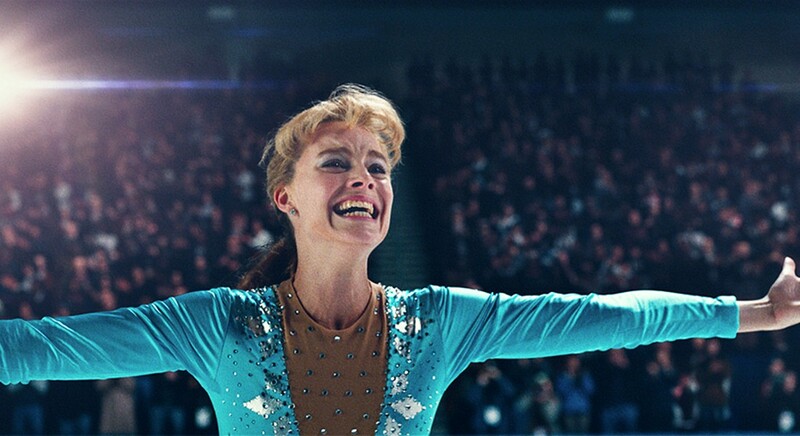 The characters in I, Tonya comment on the action as it happens, whether through re-created interviews, voice-over narration, or by directly addressing the viewer. Gillespie and Rogers provide details that look bad for Harding (a piece of paper the FBI receives has the phone number of Kerrigan's practice arena on it, in Harding's handwriting) and distort or omit some as well (Harding sued the U.S. Olympic Committee to keep her on the team; in the film, she says they kept her for the ratings). But the filmmakers establish Harding's victimhood at the outset by focusing on a key aspect of her biography: she was born into a cycle of abuse that persisted throughout her early life. In I, Tonya, Harding's mother, LaVona (Allison Janney), is a narcissistic monster who responds to her daughter's question of "Did you ever love me?" with "Do you think Sonja Henie's mother loved her?" A waitress in rural Oregon, LaVona pushes her child onto the ice at age four and believes she made the girl a champion through emotional and physical abuse. In one scene, LaVona throws a steak knife at her teenaged daughter that lodges in the girl's bicep; Tonya calmly removes the knife before slamming it on the table, the blade dripping with blood as she walks out. Tonya soon after moves in with Gillooly, her first boyfriend, and marries him at the age of 19. The older and more subdued version of Gillooly in I, Tonya denies that he hit her, but in the next scene he's beating her bloody. She kept returning to him, her character says, because she wanted to be loved, and Gillooly was the only person in her life who claimed to love her. Harding considers herself a victim in another respect—as the target of class bias from elite figure skating competition judges. Gillespie and Rogers portray the latter as corrupt snobs who dock points based on Harding's unruly "presentation." In a memorable scene, Harding chases down a judge in the parking lot after one such competition and asks why he gave her an average score for a technically perfect routine. He insinuates that her white trash upbringing, made obvious by her hand-sewn costumes, clashes with the wholesome image the U.S. Olympic team aims to project. "You're representing America, for Christ's sake," he says. "But why can't it just be about the skating?" she replies. Years later, when Harding's career is over and she's nuking a TV dinner in her microwave at home, she watches David Letterman mock her on television. The audience laughs, and Harding looks numb, as if the last shred of hope she had for the American public to love or at least respect her for skating had vanished. 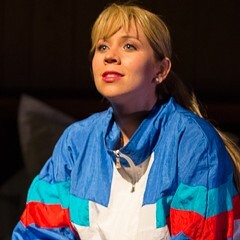 A: Her story as told in American Theater Company’s T.